On iOS the option can be accessed from the app's main menu, or else from the place cards of previously-visited destinations. Stops are arranged in linear order, including details like distances traveled and the transportation used. Users can edit locations and activities to be more precise, for instance specifying that they were cycling, hiking, or kayaking. Users can optionally receive monthly summary emails, and place cards will now include the dates of past visits. Google suggested that the Timeline can be useful for remembering discoveries, or figuring out when a particular errand was done. To address privacy concerns, the feature lets people delete single or multiple days, or else wipe their entire history. The iOS Timeline is rolling out beginning today, but may not be immediately accessible to all users. 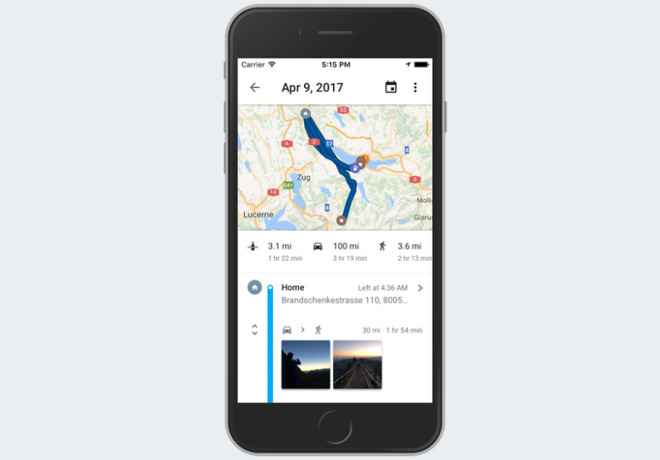 On Monday Google updated Maps with an iOS Directions widget, as well as location-sharing in Messages.